Ride the G: to Broadbeach South Station, catch the 700 Bus (Tweed Heads) to Gold Coast Highway at Twenty Fifth Avenue, Palm Beach. Then it's a short walk to AVVIA. 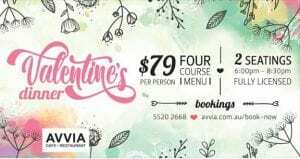 AVVIA is again hosting its very own famous Valentines Day Dinner on Thursday February 14. Indulge in four courses of handcrafted dishes which can be enjoyed with a cocktail or wine. Two seatings available either 6:00 pm or 8:30 pm. Book now lovers!